John Bercow MP, author of the Bercow Report (Bercow), a review of services for young children with speech, language and communication needs, is a long standing supporter of the Puzzle Centre and has been our Patron since 2006. I am proud to be a Patron of the Puzzle Centre. I feel that pride not merely because I am the Member of Parliament for the area in which the Centre is situated, though that would be cause enough. I feel it too as a parent with a personal interest in speech and language, and as the author of the Bercow Report into the problems experienced by children and young people with speech, communication, and language difficulties (SCLN). Writing the report, at the request of the then Government, gave me a unique insight into the difficulties experienced by young people and their parents in obtaining the specialist help that they need. In the report, I looked at examples of good practice in commissioning and delivering services that are responsive to the needs of children, young people, and families and can be viewed as benchmarks for the delivery of local services across the country. The Puzzle Centre offers just such a benchmark. It is an exemplary illustration of how education, support, and research for early years autism, combined with a commitment to improve the lives of children with SCLN through advocacy and the provision of a specialist nursery providing one to one teaching, can make a real difference. The ambitious plans that Puzzle has for the future can only improve this already excellent service. They will, I hope, continue both to advance the understanding of early years autism, and provide assistance to improve the lives of children and young people with speech, language and communication difficulties. I look forward to working closely with the Puzzle Centre in the future, and to doing all that I reasonably can to support the still greater success of this indispensable resource. 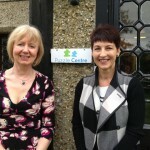 Anna Kennedy OBE, (AnnaKennedy online) joined Puzzle Centre as an Early Autism Ambassador for the charity, in April 2014. Anna re-mortgaged her own house so she could set up a school for autistic children after her two autistic sons were turned away from mainstream education. She has now expanded support for those with autism to include two schools, a college, a respite home and a website with over 63,000 international followers. The group grew rapidly and was soon attended by 275 families. When Angelo and Patrick were later turned away by 25 mainstream schools, Anna resorted to converting her garage into a classroom. After hearing about a local school that was scheduled to be demolished, Anna and her husband Sean put together a feasibility study to show how it could be converted into a school for autistic children – since there was such a need in the area. The Hillingdon School opened in 1999 with 19 pupils and is now the largest of its kind in Europe, offering 150 autistic children a safe, structured education and a brighter future. Not stopping there, Anna went on to set up a community college in 2001, a respite home for adults in 2004, a second specialist school in Kent in 2011, and now has an international following of 50,000 parents of autistic children through her website, Anna Kennedy Online. In addition, she provides training for the NSPCC and Childline on the issue of disability bullying and speaks about autism all over the UK. In 2009, Anna wrote the book Not Stupid about the struggle to set up The Hillingdon School and their patron Esther Rantzen wrote the foreword. In April 2012, she released a fitness DVD, Step In The Right Direction, and its success led to national Dance Day, which fundraises for autism charities. On 12 May 2012, Anna organised the first talent show of its kind called Autism’s Got Talent, which saw children and adults with autism perform on stage to a packed audience at London’s Mermaid Theatre. The show included a performance from autistic dancer James Hobley, who had appeared on Britain’s Got Talent. Anna was awarded an OBE in the Queen’s Birthday Honours list 2012 for her services to special needs education and autism.